I never actually tried sushi that’s authentic. I have no points in comparison versus Hashida Sushi but this almost-kaiseki ryori meal I had was certainly outstanding. Hashida Sushi is no doubt one of Singapore’s most sought after Edomae Sushi with a chef that is the son of a well-known sushi restaurant at Tsukiji market, Tokio Hashida. Chef “Hatch” (pronounced as “Haa-chi”) has 20 years of experience in his belt having graduated at renown L’Ecole Tsuji Tokyo, Japan’s top culinary school. He has been creating sushi since he was 14 years old. Now that he has opened the first overseas restaurant outside of Tokyo, budding sushi lovers can now experience seasonal produce in his repertoire. In Tokyo and located in Kachidoki, a stone’s throw away from the world famous Tsukiji fish market, Hashida Sushi is one of Japan’s premier gourmet sushi restaurants – currently headed by Master Sushi Chef, Tokio Hashida. Hashida is a portmanteau or marriage of three concepts: “Hayaru”, “Shari, Neta, Sake Wo”, and “Daremo Home”. Hayaru means fame and popularity. “Shari, Neta, Sake Wo” means superior sushi and sake which embody the essence of Hashida. “Daremo Home” means attracting food enthusiasts all over the world. Hashida Sushi’s spontaneity causes a buzz all over Singapore. Singapore is now more than just hawkers and kopitiams ~ Singaporeans are now actually looking for better options in all kinds of cuisines, sushi not being an exception. Hashida Sushi has only one branch in Singapore. Situated in Mandarin Gallery along Orchard Road, this intimate 14 seater restaurant spells the real deal Omakase for you with its long wooden table and wooden chairs. Master Chef Kenjiro Hashida and his team of chefs, Executive Chef Kimura Tomoo, Chef Kenji Nakagawa, and Chef Sato Yuji, would create their own masterpieces right in front of you and actually wait for you to taste the pureness of the fresh fish before they move on to the next masterpiece. What is unique with Hashida Sushi is that you can experience Japan’s four seasons in their sushi. This luxurious art of sushi will leave you intoxicated that only the Hashida family can offer. When you dine at Hashida Sushi you can choose among three options for lunch: Tsubaki, Ayame and Hiiragi. With Tsubaki, there’s a light assortment of Nigiri Sushi plus dessert. Ayame has starter and premium Nigiri Sushi. Hiiragi has an even more appealing luxury serving you with seasonal sushi as well. I chose to eat Tsubaki. Chef Sato Yuji was creating his Omakase for me at that time. 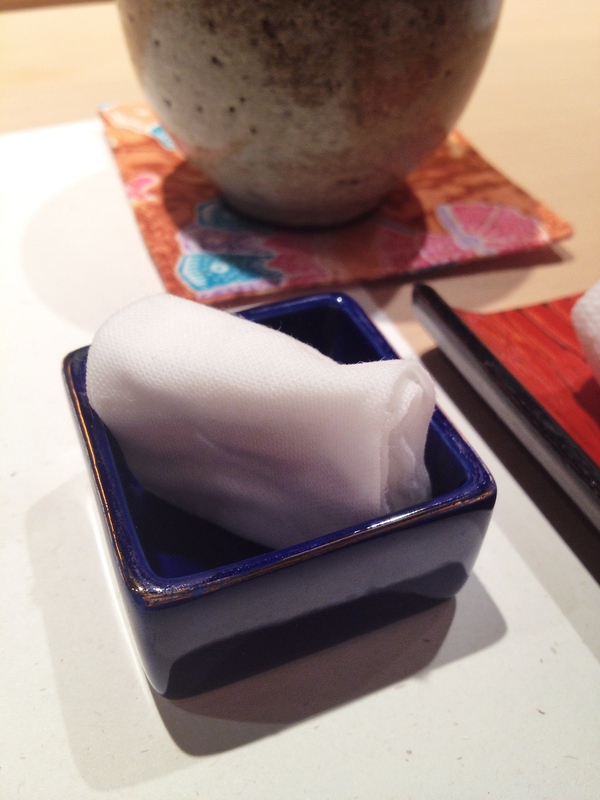 The Tsubaki sushi course starts with Sazizuke or the equivalent to a French amuse-bouche. The tofu is so milky and creamy. There’s a hint of wasabi taste that’s spicy in subtlety. I was given Japanese tea and some ginger. This will allow me to clean my palate after every sushi tasted. Chef Sato started with a Japanese sea bass. I can tell that the fish is fresh and sliced perfectly. The meat is succulent and very sweet. The rice is packed and not too sweet or vinegar in flavor. I like that they gave a strong importance when it comes to the rice. The white hull rice grains are imported from Japan and is the secret to good sushi. Mixed with rice vinegar and premium sugar, the rice married with the fish and light soy sauce is key to Hashida Sushi’s perfectly balanced sushi. I didn’t need to dip it in soy sauce as there’s already a hint of soy and wasabi glazed atop the fresh fish. 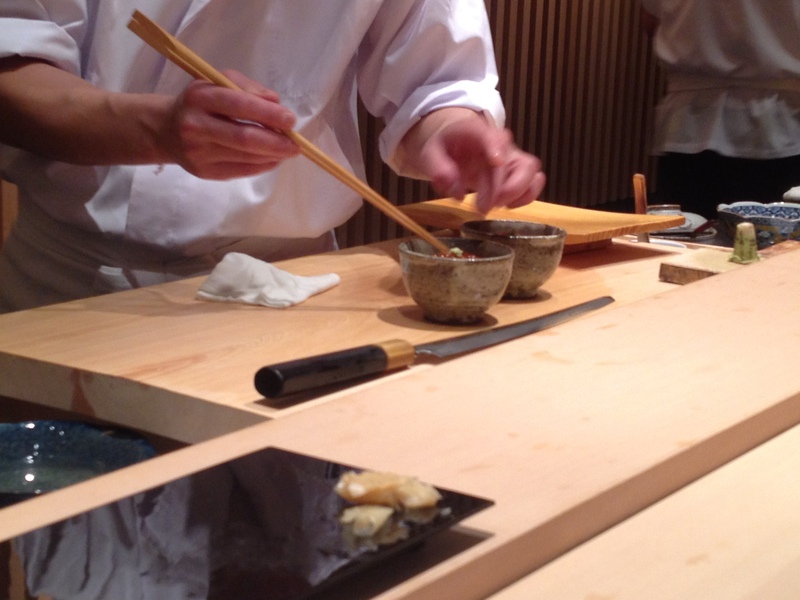 I noticed that Chef Sato would wait for me to finish the sushi first before moving on to the next sushi. This time it was a Cumberjack, which I am not familiar with, but the meat is springy and a bit chewy. I was extremely entertained with the way Chef Sato created his dishes. Yes, before I get to taste the sushi, I have the pleasure of watching Chef Sato prepare it for me using his traditional utensils. The fish are never stored in a freezer, and are stored using traditional wooden ice boxes. I was served with more variations of Tuna. I am not well-versed in it, but I know that these are either from Se-Kami, Se-Naka, Se-Shimo, Hara-Shimo, Hara-Naka (Chu-Toro), and Hara-Kami and these are from varying degrees of fat in the Tuna fish. It was just delicious. The rice never fell off and extremely packed. Each slice of fish meat was glazed with soy sauce that’s not too much nor too less. Next, the Penshell Sushi was served for me. It was more difficult to chew this sushi since the meat was a bit hard for me. This is Chef Sato creating the Tomewan for me. After all the sushi I’ve eated, the main course was just about to be served. Hashida Sushi’s signature rice topped with salmon roe and mixed with Nori, also with some delicious Wasabi. Served with this salmon roe rice is miso soup. I am in love with this meal. Each bite of the salmon roe has a burst of flavor in it. I enjoyed every bite of it and I wanted one more bowl! I was a bit full after the salmon roe bowl but the sushi just kept on coming. The ever traditional Chef Sato served me with some Tuna Temaki after my salmon roe rice bowl. I was served with a rectangular piece of Tamago. It’s sweet and of course, my favorite. I knew that my next sushi was the finale of Chef Sato’s show. The chutoro sushi was just fatty and well presented. Just genius. The Tsubaki meal comes with dessert. I was instructed to eat the chocolate yogurt piece first and dipped it on the grains of salt scattered on the plate, then move on to the Macaron. It was a perfect way to end my Tsubaki meal. Chef Sato ended the Sushi art with a bow. Hashida Sushi left me with impeccable taste. I know I will never see sushi the same way again. I know I will also never settle for sushi anything less than this anymore. I’ll be sure to go back again to Hashida Sushi once again to try out their dinner menu with Chef’s Omakase and Tessen. I strongly recommend you to take a reservation before you dine at Hashida Sushi. The place can get crowded during lunch times.